Cars 2 is a Disney film released June 24th, 2011 as a sequel to the 2006 hit animated film Cars. 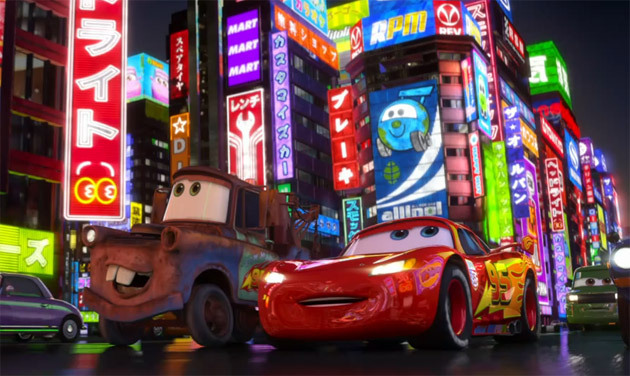 In Cars 2, you are taken on quite the adventure as Lightning McQueen, Mater, and the gang travel the world for McQueen to race in the World Grand Prix. The context of the movies is rather generic for Disney films which in most cases would make a par film, but the overall delivery of the content and story of the movie allowed Disney to capture attention once again. Though it is really debated on who’s film it really was, I believe Cars 2 more focuses on Mater, the tow truck who becomes Lightning McQueen’s best friend in the first Cars movie. Traveling around the world with Fin McMissiles and Holly Shiftwell, Mater helps to figure out what is causing the other race cars to blow engines during the first two races of the World Grand Prix. Eventually in the end Mater is the last hope for finding the root cause of all the engine explosions bringing the founder of the World Grand Prix in the movie, to justice. To not spoil the movie too much more, I would have to say that I recommend this movie for the amazing visual effects, decent story line, and overall the action packed adventure that demands your attention throughout the movie. Though there are parts of the movie that are a little sketchy, the overall movie was fantastic. I would have to say out of 10 stars this movie would get about 9.5 for the overall fact that the movie did what it was supposed to. And that is to Entertain, and to keep the audience watching. Next Next post: Is the most popular search engine cheating? Is this a must see movie?